Picture credit to: Biodiversity & Community Health. A study published in the National Bureau of Economic Research in the Fall examines cash transfer programs across a range of developing countries and uses household data from Indonesia and Peru to examine the effectiveness of targeted transfer programs in those countries. The study explores the costs and benefits of targeted and universal cash transfer programs, and the different circumstances that developing countries face that affect the performance of different transfer schemes. One of the key challenges identified for developing countries that affect the viability of a universal basic income (UBI) are the sizes of the informal sector (1) and the resulting revenue sources. Developed countries largely get their revenue from income taxes (2), but given the size of the informal sector in many developing countries, the bulk of government revenue comes from sources like consumption taxes and official development assistance (ODA), with the latter in some low-income countries accounting for more than half of that country’s operating budget. Effectively targeting the poor for cash transfer means that you must have a way to reliably measure income and means, and therein lies the problem for many developing countries. In Indonesia and Peru, 88% and 79% of the employed populations are reported as below the tax exclusion threshold, and therefore do not pay income taxes. This is not necessarily to say that upwards of 80% of true income is below the income tax threshold, but it shows the problems associated with informality and lack of information. In any case, it complicates the means-testing portion of targeted transfer programs like those in the US. In lieu of directly measuring income for means-testing, developing country governments can use what’s called a “proxy-means test” by measuring indirect things like assets and consumption. Another complication is that people can easily misrepresent their economic situation, depending on what indicator the proxy-test uses to measure poverty. Therefore, the mechanism for determining who qualifies for the transfers are often a mystery kept by the designers of the proxy-tests, and the data collection method must in some way provide incentives for telling the truth. 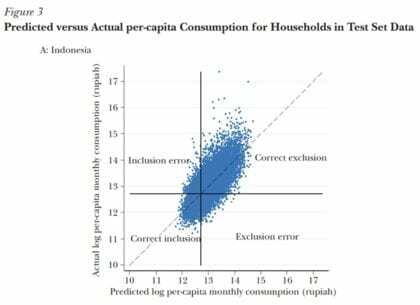 To measure the success of the targeted programs in Indonesia and Peru, the authors used consumption data from 2010-2011 period from the Indonesian National Socioeconomic Survey (SUSENAS) and the Peruvian National Household Survey (ENAHO) to measure the size of the program’s “inclusion errors” and the “exclusion errors”, meaning the amount of people who do receive transfers who shouldn’t and the amount of people who don’t receive transfers who should. They are able to do this because the datasets used provide information on predicted consumption used by the proxy-means tests of each country, and the actual consumption for that period in each country. 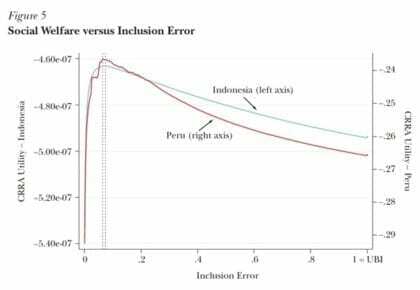 In the 2010 period, in both Indonesia and Peru, transfers reached around 80% of intended beneficiaries, meaning those whose economic situation actually qualified them to receive benefits got them 80% of the time, and 20% did not (meaning a 20% exclusion error). There was also a cost of transferring the benefit to 22% and 31% of those whose economic situation did not actually qualify them for the benefits, judging by the actual consumption data (meaning the inclusion error). The authors then employ a social welfare function, which measures the utility of a dollar between a low-income person and a high-income person, to measure the effectiveness of more narrowly targeted programs in relation to a universal program (UBI). Using this function, they were able to identify a socially optimal targeted transfer amount, which was 19% and 18% of the population for Indonesia and Peru respectively. While utility is lowest at the point of no transfer, the graph shows utility and overall social welfare both decline steadily after the socially optimal point. A UBI, then, has the lowest utility of almost any ratio, and even with the administrative cost savings included, the added benefit is almost imperceptible (these are represented by the little tick mark pointing upwards at the point of “UBI”). This is nothing too surprising, though, because it essentially confirms that having a system where wealthier individuals also receive the benefit is not as socially efficient as targeting the poorest individuals, because the dollars are worth more to poorer individuals. What is interesting is that savings in administrative costs in this model also do not provide a big boost to social welfare. A UBI would address some of the failings of targeted transfer programs by providing what the authors call “horizontal equity”, which essentially measures the degree of errors at different levels of transfer, and also an added benefit of transparency. If we imagine a family in the exclusion error population goes to apply for benefits and find that they are not eligible, verifying their eligibility would be difficult given the secrecy of the methods used in proxy-means identification. A UBI would be an ideal fix for this problem because it is available to everyone, and though you would be including those who may not necessarily need it, you would not deny anyone who actually does need it. There is also the issue of labor market distortions that targeted transfers can cause. It is well known that programs in the US and in some European countries result in recipients to avoid finding work because they risk losing their entitlement. Even if the methods used in proxy-means testing are not known, households in developing countries may restrain themselves on activities that they perceive may end up disqualifying them for the benefit, such as reducing consumption or avoiding formal income. Other issues with a large informal sector that would complicate implementation of a UBI are identification to avoid double counting, getting the money to recipients that may not have bank accounts or formal residences to mail a check to, and accruing taxes from the rise in incomes that will occur through increased consumption. Dependence on consumption taxes also presents a risk to the scheme, because large informal sectors might also affect tax losses from consumption. The primary strength of the argument for UBI in the context of a developing country comes from the fact that targeted transfers currently deny resources to some of the extreme poor, where a UBI would theoretically not be denied to anyone. It would also theoretically be more straightforward and fairer of a system. A crucial strength with targeted transfers comes from the fact that it can use limited resources the most effectively, and even if it misallocates some resources, on the whole, it can effectively allocate resources. It makes sense on an intuitive level for developing countries with tight budgets to send money where it would be the most effective through targeted transfers, but this results in both inclusion and exclusion errors, which can either be seen as the best outcome possible or simply insufficient. The exclusion error population could be seen as an unacceptable outcome creating a highly underprivileged class, and even the definition of the population that qualifies for transfers might be considered insufficient. In Indonesia, while the impoverished population has been receding, during the Asian financial crisis it rose to as high as 23%, and the population that is “near poor” have been estimated to be as much as 42% (3). This could play into an argument for UBI: by allowing everyone to have the same benefit, there would be no inclusion or exclusion errors, and it would still be much more socially optimal than no transfer at all. While the authors recognize that targeted and universal programs work well in different circumstances, they seem to imply that, for developing countries, the social welfare achieved by targeted transfers is currently the best game in town. 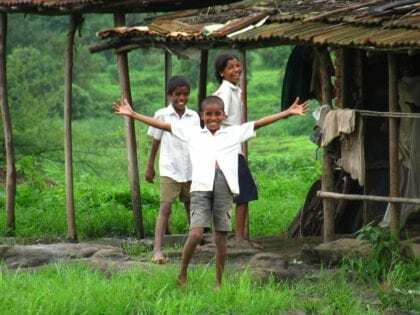 Universal programs like public education and health care are two examples of already widely accepted government programs, yet cash transfer programs remain largely targeted. The authors also introduce some interesting alternatives that capture some of the strengths of targeted and universal programs. For example, with “community-based targeting”, a village might get a certain number of “beneficiary slots”, and in a completely public setting, the village communally decides where to allocate them. The strength of this program seems to emanate from the fact that local communities have a more intimate knowledge of who needs the assistance the most. In the “differential cost and self-identification” method, benefits would be available to an entire population like UBI, but your relative wealth would affect the ease of which you get the benefits, as determined by a proxy-means test. The key to this program would be the fact that the benefits are worth less the higher up the income ladder you are, and things like long application processes would deter some applicants. The added benefit to this would be that those who are in the exclusion error population would receive some recourse if they are initially denied benefits. It is clear that having an income tax base with which to measure prosperity and draw taxes from is currently the ideal system to operate with a UBI. Jenson (2019) demonstrates that development accompanies a shift from self-employed to employed populations in the United States with over a century of data, which could be the natural outcome of development in other contexts. If a UBI turns out to be an ideal system for reducing extreme inequality and increasing other indicators of human wellbeing, a question of its appropriateness might also entail identifying the correct level of development. Advancing this issue still requires more pilots in more varied circumstances. This research adds to the knowledge of basic income in developing countries from pilots in Namibia (2008), Madhya Pradesh (India, 2010), and in other expansions of cash transfer schemes in Zambia (2010) and in Iran (2011). 1 – The informal sector describes the portion of the population who work but do not contribute to a social security system, are often self-employed, and whose activities and revenue amounts are largely unknown. 2 – By contrast, in the 2017 US Federal Government budget, 83% of revenue came from individual income and payroll taxes. 3 – Figures from the World Bank’s report “Making the New Indonesia Work for the Poor”. Benjamin Sadlek has written 4 articles.